you plan to sell or you want a comfortable, carefree lifestyle. Mold is not only unsightly, it can also cause structural damage, allergic reactions and respiratory problems. Clark’s is certified and insured as a mold remediation company, and all our work meets EPA and OSHA guidelines. Mold spores play a significant role in nature by breaking down dead organic matter, like the fallen tree in the woods. However, these same spores, left unchecked in your home environment, can lead to significant damage and/or health concerns. Not all people react the same when they come in contact with mold. However, mold has the potential to cause health problems, especially in people with immune deficiencies or those with respiratory conditions. Also at risk are infants, children and the elderly. 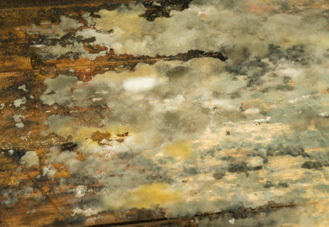 What is the difference between mold and fungi? Fungus is a microscopic substance that exists in the air around us all the time. It is neither plant nor animal, nor a type of bacteria – it’s a separate type of living organism that occupies its own kingdom of classification. 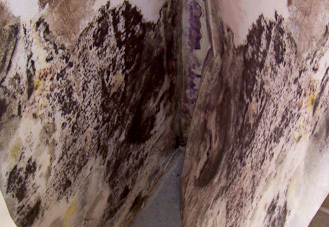 Mold is one type of fungus. There are hundreds of thousands of species of fungi. 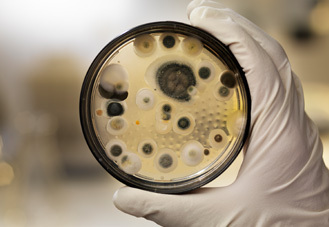 The only way you can be 100% sure a certain fungus is indeed “Mold” is by having it tested to confirm that it is a mold. Surface fungi can grow on the wood of the floor system in a crawlspace if the wood moisture content is 20% or greater. 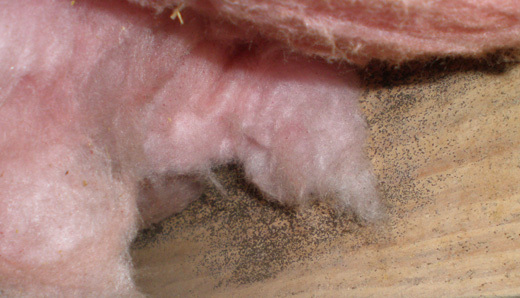 Wood-destroying fungi will occur if the moisture content is 28% or greater. 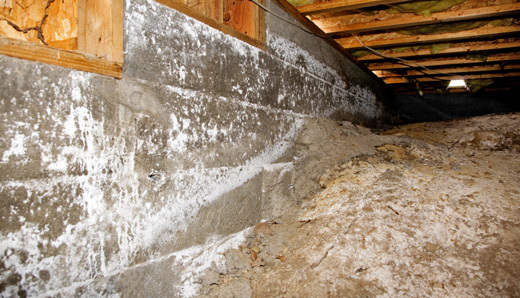 Moisture control in your crawlspace is the key to preventing mold and wood-destroying fungi. We feature the ATMOX Crawlspace Ventilation System as an economical and effective alternative to Encapsulation. ATMOX uses a combination of fans installed in the crawlspace vents and dehumidifiers. 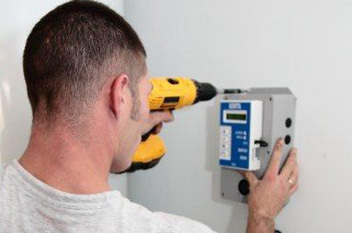 A controller is installed that measures wood moisture content, crawlspace humidity and outside humidity, and determines when air from the outside should be circulated through the crawlspace, or the crawlspace should be closed off and the dehumidifier used. A control is mounted in a convenient location so you can monitor the status of your crawlspace at any time. Homes used to be relatively simple in their design: rectangular in shape, with nothing to block air flow through the crawlspace. Crawlspace vents were spaced so many feet apart on all sides so that air could flow through and somewhat effectively help control moisture. But today’s homes are increasingly more complex with large garages, multiple garages, large porches on many sides and limited space to install vents. This creates large pockets of dead air in the crawlspace. The ATMOX system includes fans designed to hang from the floor joists and circulate the once-dead air so that it can be processed by the dehumidifier or replaced with acceptable outside air. Controlled ventilation for the entire crawlspace! Our ATMOX Crawlspace Ventilation System uses a series of intake and exhaust fans strategically placed in select crawlspace vents to ensure air circulates through the entire crawlspace. Vents that do not require fans are closed off. Sensors measuring dew points inside and outside the crawlspace feed the controller information where it determines whether to exchange air, dehumidify or simply keep the status quo. It’s a smart system that’s simple to operate. All homes with crawlspaces should have a vapor barrier because the ground contains moisture, and that water naturally evaporates from the soil. A vapor barrier prevents the moisture in the ground from escaping where the vapor barrier is installed. But sometimes, a vapor barrier isn’t enough. Runoff (surface) water can penetrate foundation walls and ground water can seep up through the soil into your crawlspace. Then a French drain is needed to divert the water to a drain system which directs the water from under the crawlspace and away from the house. Sump pumps are sometimes needed when there is not enough “fall” on the outside of the house for a gravity drain to work properly. Vapor barriers are simply sheets of polyethylene placed in the crawlspace in a way that prevents moisture from escaping into the air. A minimum of 6 mil is recommended to reduce the opportunity of ripping or punctures. In all cases, the edges of each sheet overlap the other sheets to complete a solid barrier. In crawlspaces where moisture is not really an issue, a simple vapor barrier with overlapping edges covering all areas up to the foundation walls can be sufficient. 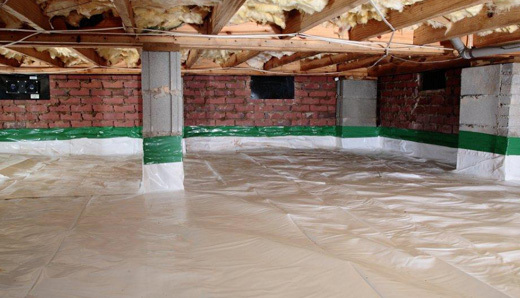 In other cases where ground water is present or surface water is suspected of penetrating the foundation walls, a super vapor barrier may be needed. The super vapor barrier overlaps the other sheets of poly and the edges are tapped. The poly is extended up the foundation wall until it is at least 6 inches above the exterior grade. This configuration forces the moisture below the barrier and into the drainage system. Our French drains include corrugated pipe surrounded by 57 granite stone and wrapped in filter fabric. These pipes channel the water to either a catch basin with a sump pump installed or to a discharge line dug under the footer and piped away from the house where gravity lets it drain naturally. All water in a crawlspace is captured by French drains and diverted either outside via a gravity drain or to a catch basin. Sump pumps are used to pump the water from the catch basin to an area far enough away outside so the water can’t re-enter the crawlspace. Nothing’s more gratifying than having the best-kept lawn in the neighborhood – especially when someone else does the work! Your lawn is the first thing you see when you come home. Don’t you deserve to have it healthy and looking great? With Clark’s professional landscaping and lawn treatment services, it’s a breeze year-round. *Currently servicing the Greater Columbia area market only. Clark’s offers a full range of landscaping services; just tell us how much or how little you want done, and we’ll take care of the rest. 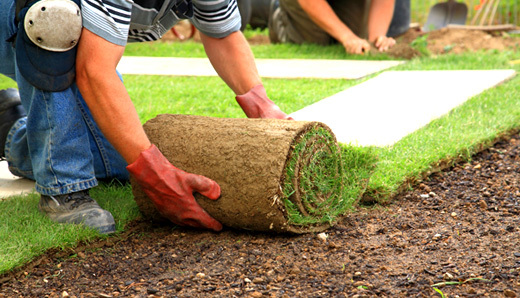 Our landscaping crews are professional, reliable and know how to keep your lawn beautiful. Pretty is nice; healthy is even better. Clark’s knows what can plague South Carolina lawns, and our professional technicians in Columbia are ready to help. Ants are America’s number one pest problem and fire ants are a special breed. These aggressive stingers can have colonies of up to 250,000 workers ready to strike you, your family and your pets. Fire ants are reddish, quarter-inch-long ants with a nasty sting they’ll use on just about any animal (or human) that crosses their paths. They nest in unsightly mounds of one to two feet in diameter and about six inches high, often near moist areas. They can ruin your landscaping, cause problems with the electrical components in your air conditioning unit and trigger allergic reactions in some people and pets. 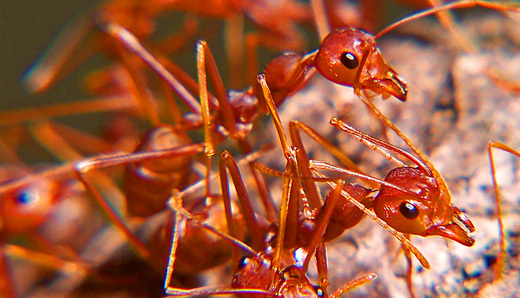 Clark’s knows fire ants love South Carolina, and our technicians in Greenville/Spartanburg, Charleston, Columbia and Sumter are specially trained to rid them from your property once and for all. Two applications of fire ant bait per year are usually all you need to be done with fire ants. This treatment is specially formulated for these tough pests, yet safe for humans and pets. Just one application of Topchoice® per year and you can say goodbye to fire ants, guaranteed! Topchoice® is also effective to control fleas and ticks for 30 days and mole crickets for up to 3 months. This effective treatment is safe for animals and humans and will not kill beneficial yard organisms. We frequently use this product in playground and sports field areas at churches, schools and recreational facilities. For those who prefer the traditional approach, Clark’s lawn pesticide treatment kills not only dangerous fire ants but also every insect bugging you and your family. 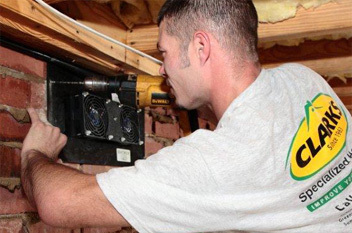 Through our many years of termite inspections and repairs, we’ve gained invaluable experience and expertise in home repair and improvements with special attention to the structural integrity. Our customers helped us identify a need to provide additional home improvement services to our community by a contractor that is licensed, insured, experienced and willing to stand behind their workmanship. Clark’s staff includes licensed residential home builders and a licensed general contractor with years of experience – everything from simple repairs to structural and floor system repairs, bathroom remodels and additions. We are actively involved with the local, state and national home builders association in an effort to promote quality home construction and improvement and fair competition for the consumers and contractors of South Carolina. Stay current with news from us and any specials we may be offering. Unidentified bug or critter? Snap a photo and we’ll identify it for you. Find out how Clark’s can keep your new home pest free. Check out our blog for the latest from the world of bugs and more. ©2016 Clark's Termite & Pest Control, Inc.